Jacqueline Newbold is a watercolor and mixed media artist. 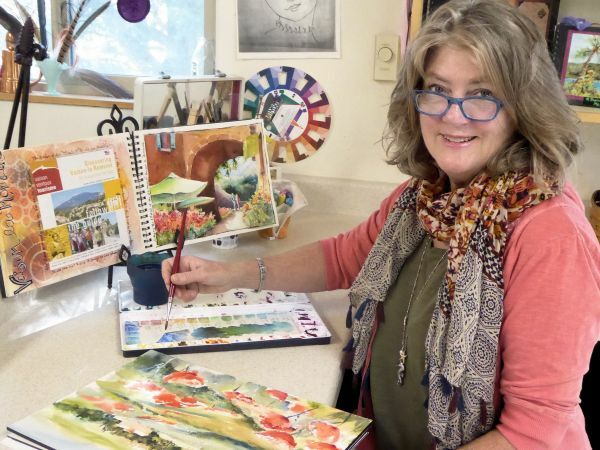 Using a warm and lively palette, Jacqueline Newbold’s colorful watercolor paintings often depict the dramatic skies over the Oregon Cascade Mountains, fields of red poppies, rows of lavender leading to a rustic barn, or charming European café scenes. Her studio is in Bend, Oregon. Much of her inspiration comes from her travels. She brings her efficiently organized backpack of painting supplies and art journal and experiments with various imaginative ways to combine watercolor with mixed-media. Spending time creating in her art journal is her favorite artistic outlet. 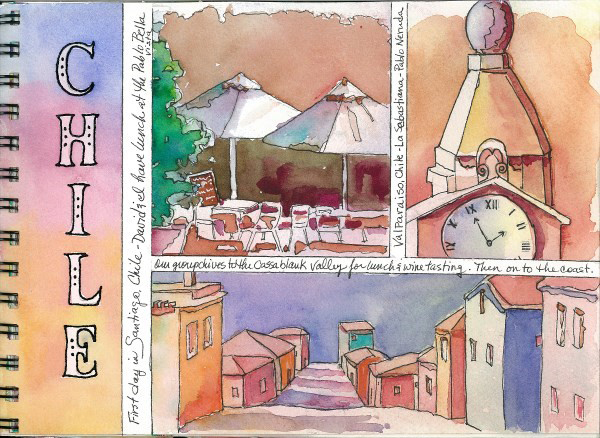 “Art journaling to me is not so much about making art but recording my life in a colorful way. My journals are a place where I can experiment with different art mediums, sort things out, write about my life, my sorrows, my adventures, and travels. I play with color, sketch, doodle, take notes, make lists, add inspiring quotes and write about my day. The process is fun, and I love when the result surprises me. how I develop textured backgrounds for sketches, paintings, writings, mini-collages, photos, and poetry. Growing up in an Air Force family, traveling has been part of my life since I was born in Tokyo, Japan. 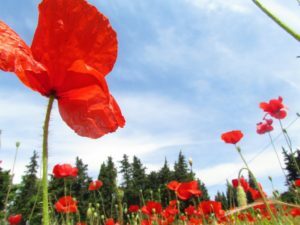 My mother was born in Paris, France and married my dad, an American G. I. from Iowa. Our young family of four traveled the world and lived in foreign countries giving me an international upbringing and a love for travel. Little me. 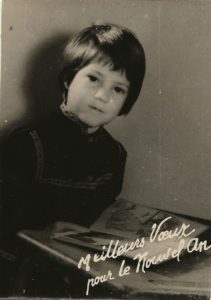 This photo was taken during kindergarten in Paris, France. 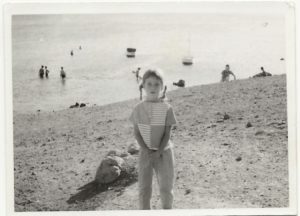 Little me at a beach in Greece. We settled in Montgomery, Alabama during the tumultuous years of racial unrest of the 1960’s. After graduating from the University of Alabama, I realized that though I had traveled many parts of the world, I had never been to the western states of America. Coming out west, I spent time in Washington, California, and Oregon. 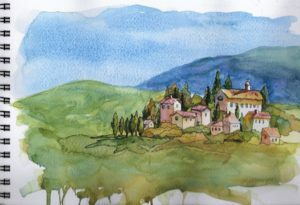 My gypsy life was left behind when I took up residence in Bend, Oregon and it was here that I took my first watercolor class. At that moment I fell crazy in love with color and I now consider myself to be a painter of color. 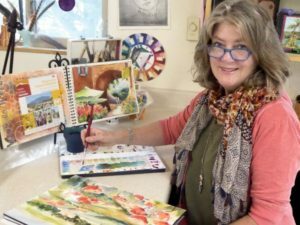 She shares her passion for watercolor painting and mixed-media art journaling by teaching art classes and workshops at her Bend, Oregon private studio, the Art Unraveled Art Retreats in Phoenix, and the Art & Soul Retreats in Portland. 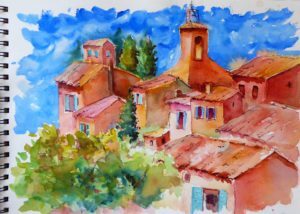 She has conducted watercolor workshops and art classes in France and Italy. Her next overseas workshops are in Orvieto, Italy, September 2018 and Provence, France in May 2019. Jacqueline’s art is available at the Red Chair Gallery in Bend. 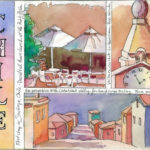 You can find out more about her creative adventures on her blog, www.djnewbold.blogspot.com. 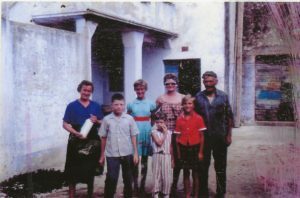 Our family went on a long camping trip through Greece, Yugoslavia, and Italy. Here I am with mom and my brother visiting friends.